Last month, we brought you the news of Michael Cole’s Dodge Challenger SRT Hellcat, which had set the world record for the quickest Hellcat-powered car with an automatic transmission. Back then, his best time was a 9.05, but his record was broken when the HHP Hellcat Challenger known as TopCat claimed the record with a time of 8.883. 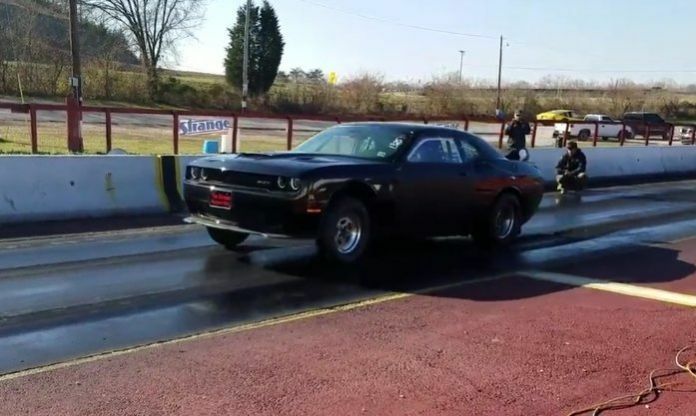 This past weekend, Cole and his Challenger headed back to the track with hopes that cooler air would yield an 8-second ET that would beat the TopCat – and he did just that. With a run of 8.79 at 156.77 miles per hour, Michael Cole’s Challenger is the quickest Hellcat in the world with the 8-speed automatic transmission while being the second-quickest Hellcat car in the world, traiing only the Epling Garage Hellcat that ran an 8.68 with a manual transmission. In case you missed our previous piece on Michael Cole’s Dodge Challenger SRT Hellcat, here is a quick rundown of the modifications. First and foremost the transmission and rear differential – right down to the 2.62 gear set – are stock. The transmission has been tuned to optimize the shift points, but beyond that the 8-speed automatic and the rear diff are unchanged from the factory. He did swap to smaller rear brakes in order to allow the 15” wheels to fit, reducing weight and making plenty of space for the smaller wheels wrapped in sticky drag rubber. Under the hood, the Hellcat Hemi is relatively stock, with the only changes being a smaller upper pulley, a nitrous setup and a high quality tune from Injected Engineering. The supercharged, the camshaft, the cylinder heads and everything else inside of the Hellcat Hemi are untouched, but it packs enough power to rocket down the track well into the 8-second range. When Michael Cole set the automatic transmission Hellcat record last month with his 9.05 run, he had hoped to make one more run that day with more nitrous, but he wasn’t able to get another pass down the track. Fortunately, he headed to the track this past weekend, and with a combination of more nitrous and cool air, he was able to break into the 8s. In fact, he ran a handful of 8-second ETs, beating previous automatic Hellcat record of 8.883 and setting the new record at 8.79 at 156.77 miles per hour. That is just 11 hundredths of a second behind the quickest Hellcat in the world, but if Cole and his Challenger can find more time to hit those few tracks around the US that are still open – we could see him battling for the overall quarter mile record. In the meantime, he has to settle for “only” being the quickest Hellcat car in the world with the 8-speed automatic transmission.